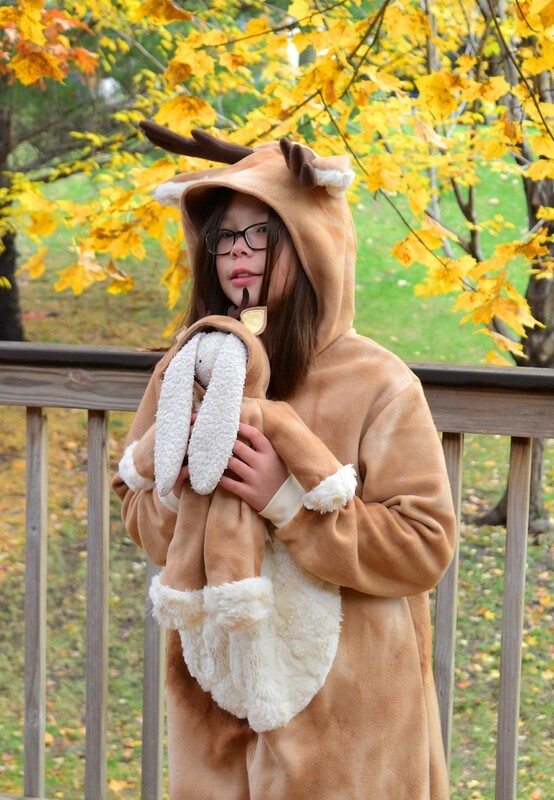 Kate and Bunny were a deer family this year for Halloween. In recent years, Kate has had me make Bunny a costume that coordinates with her own. In 2015, Kate was a rabbit and Bunny was a carrot. In 2016, Kate was a fairy and Bunny was an elf. Last year, Kate was Ginny Weasley (from Harry Potter) and Bunny was some kind of personal pet. Four years later, I think I've figured it out: if Bunny has a costume, then Bunny can accompany Kate to any and all Halloween-related activities, including the fall parties at school. Could it be? Kate, grinning smugly, confirmed that yes, it was exactly so. 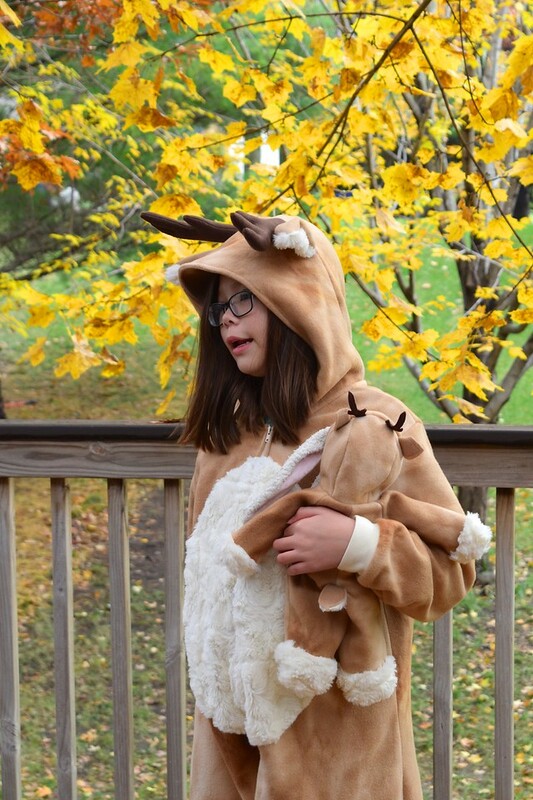 Kate's deer costume (not reindeer, she cautioned me when we were designing it together) was simple enough to make. 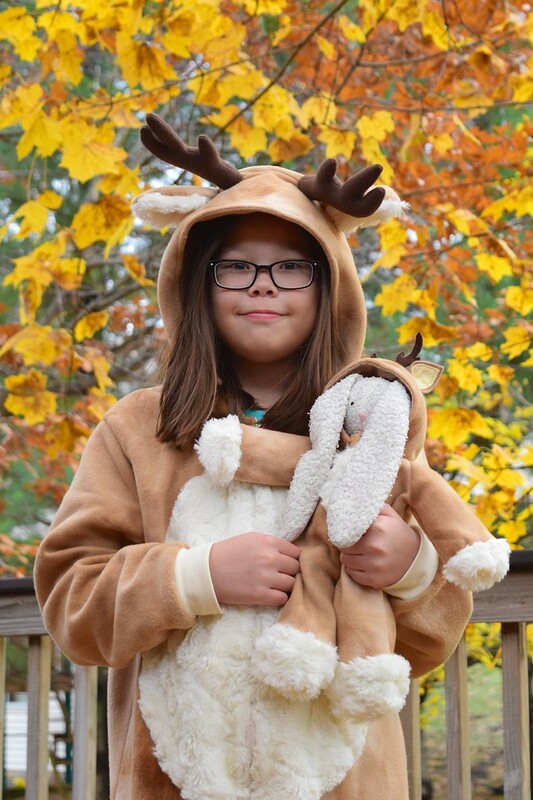 It's essentially a sleeper PJ thing, like her rabbit suit and many other animal-themed onesies that are found in stores like Target and Walmart. 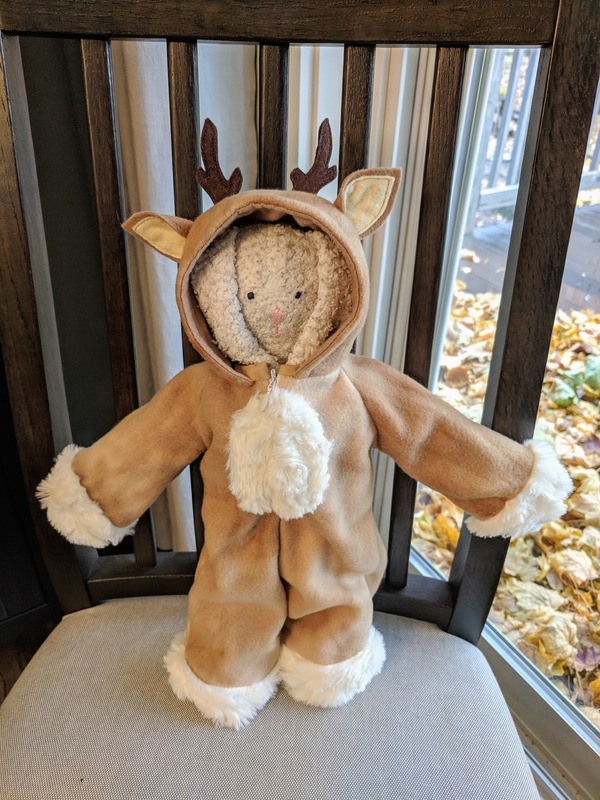 But where her rabbit had sleeves and legs that ended in simple hems, Kate wanted elasticized cuffs for this deer suit. She explained that they kept the fabric from riding up her limbs, which was very helpful for cartwheels and tumbles. Which, apparently, deer do a lot of. The hood is the only part of the outfit that's lined - mostly for structure so that it doesn't degenerate into floppiness. 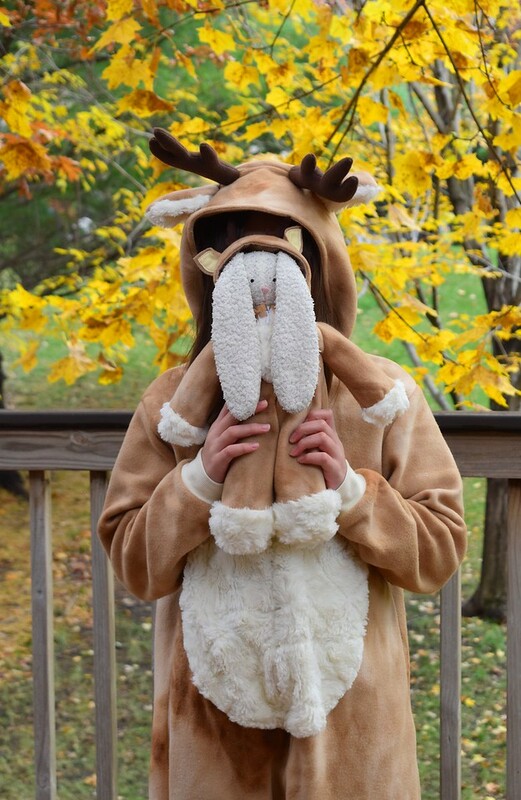 There are stuffed antlers and fuzz-lined ears that insert in seams in the hood construction. The rest of the outfit is a single layer of fleece, and because fleece doesn't fray, I didn't even bother to serge the SA on the inside. The outfit has a central front zipper that runs through the furry belly panel (this is simply a large applique patch). 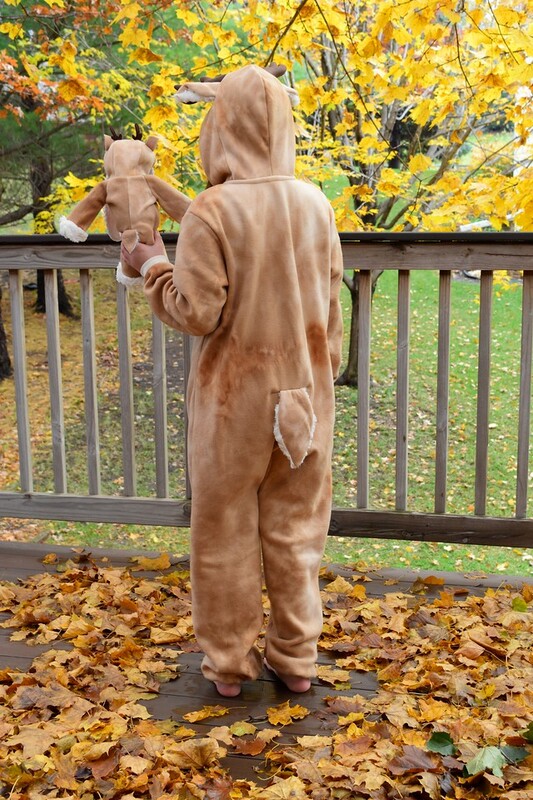 Here is Bunny's outfit: also a zip-up onesie suit. The antlers and ears are edge-stitched felt rather than stuffed fleece - for doll-sized features, I try to avoid creating structures that must be sewn WS-out and whose SA then clog up the sharp points and other narrow parts of the finished shapes when turned RS-out. A few more differences: one, Bunny's suit has raglan sleeves. Reason: Bunny has indistinct shoulders, which make it challenging to determine the position of shoulder seams so as to set in regular sleeves. Also, in place of cuffs, the sleeves and legs end in enclosed "mittens". They saved me the effort of turning hems, and it's not as if Bunny needs to actually use her hands and feet. And finally, Bunny's hood is differently-shaped, entirely because Bunny's head is much flatter dorso-ventrally than a human head. This is a trivial observation, I know, but I wanted to share that weird fact so we understand that not all hoods are sewn the same way. If you are so inclined, look at the hoods on the various coats and sweaters in your (and your kids') closet(s): some are simply two pieces (left and right) sewn together along a central seam; some are three longitudinal panels (symmetrical left and right pieces connected by a central 'gusset') which hug the back of the head more closely; some, like Kate's and Bunny's here, are a combination of transverse and longitudinal seams that allow inserts like horns and ears and other anterior features, and design elements like drawstrings and snaps. Here is the back view: both suits have a little tail that attaches in a shallow dart (not a seam) in the fabric itself. So deer and fawn this year. I can't wait to find out what Kate will pick for herself (and Bunny) next Halloween! The luckiest bunny in the world... Super costumes! You are so talented! Gorgeous!